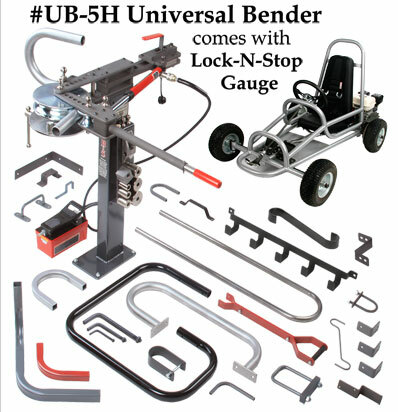 The UB-5H Universal Bender will make up to 180 degree bends in up to 1-1/4” schedule 40 pipe, up to 1-5/8” (outside diameter) 10 gauge round tubing, and up to 1-1/2” 10 gauge square tubing. It also will form a wide variety of sizes of flats, solid squares and solid rounds for all your metalworking projects. If you’re looking to construct ornamental iron, the #SA Scroll Attachment, #PTA Picket Twister, and #BA Basket Attachment are all designed to work on the UB-5H Universal Bender. The #PTA Picket Twister or #BA Basket Attachment is not designed for the UF-25H Universal Fabricator. All the bends in our project book on benches can be made on the UB-5H. However, you will need the #SA Scroll Attachment and the #PTA Picket Twister for some of the bench designs. Every UB-5H comes standard with the Lock-N-Stop Gauge. Once you use this gauge, you will soon realize what an important role it plays in your ability to make precise repeatable bends. The Lock-N-Stop Gauge, with its engraved numbering system, not only gives you a way to make precise bends of a particular angle (one that may be called for in one of our project books) but also gives you an accurate way to repeat any of your own angles you determine are necessary for one of your projects. Shown above is a photo of the Lock-N-Stop Gauge set on 18&3/4. This is the correct number setting for forming the 1-1/4” round tubing to 90 degrees, as shown being bent above. The 130 page instruction manual for the # UB-5, UB-5H, and UF-25H list all the Lock-N-Stop Gauge settings for power bending 45, 90, and 180 degree bends on all pipe, round and square tubing dies that are available for these machines. The Lock-N-Stop Gauges on the UB-5, UB-5H, and UF-25H are identical on all three machines. Keep in mind, the UB-5H is simply a UB-5 with the hydraulics added to it. The hydraulics are necessary when forming square tubing, round tubing, and pipe on any of the forming dies one inch and above. A heat treated Right Angle Bend Attachment comes standard on all three machines and is used for bending flat stock where a minimum radius is needed. Hydraulics are not used when using this attachment. However, the Lock-N-Stop can be used.